"I ENCOURAGE MY ARCHITECTURE STUDENTS TO ENHANCE THEIR DESIGN SKILLS WITH COURSES SUCH AS: PHOTOGRAPHY, WRITING, PIANO (MUSIC), DANCE HISTORY, DRAWING AND ART. I TEACH MOST OF THOSE COURSES UPON REQUEST AND DO MY BEST TO HELP DIRECT STUDENTS IN A FULL HIGH SCHOOL EDUCATION IN THE ARTS. ARCHITECTURE IS SO MUCH FUN AND IS TRUELY A STUDY WHICH INVOLVES MANY MULTIPLE DISCIPLINES. THE LEARNING PALLET IS UNLIMITED. IT IS SUCH A BLAST TO COACH LIKE MINDED KIDS!" 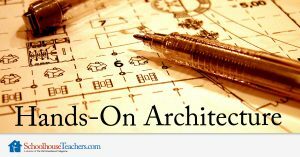 (THESE COURSES ARE CALLED, " HANDS-ON-ARCHITECTURE"
WERE CREATED AND ARE TAUGHT EXCLUSIVELY BY MRS. G.